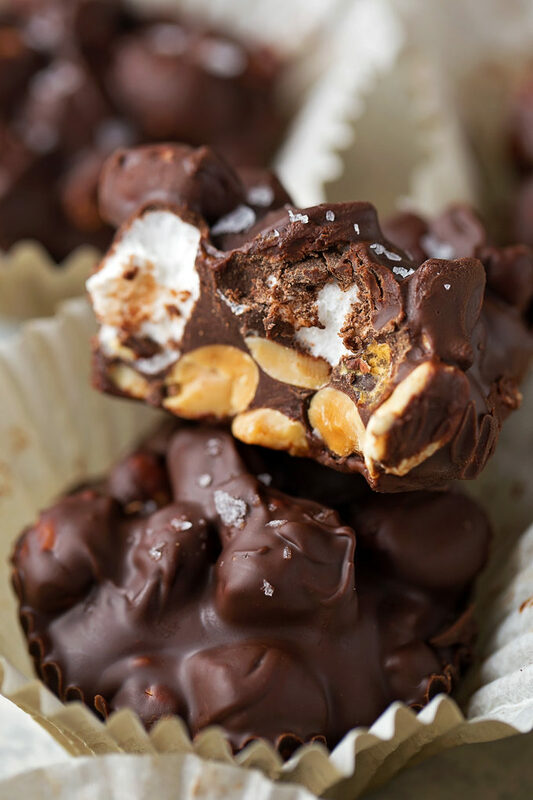 6 ingredient rocky road cups that are made in the microwave in minutes. 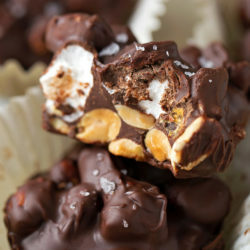 This simple recipe yields a sweet and salty candy that everyone will love! A few weeks ago I posted a poll on Instagram to see if anyone was interested in this “recipe” and soooo many of you guys said YES! 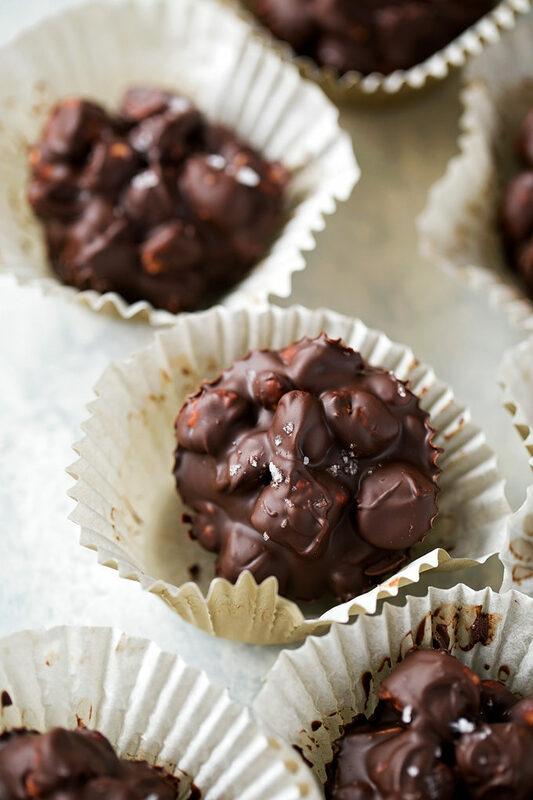 🙌 😘 These decadent little candy cups are the perfect combo of sweet and salty. They are quick, effortless and only require 6 ingredients! 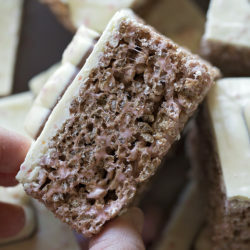 You can make them in a muffin tin, spoon them onto a lined baking sheet or form them into bars. Run to the kitchen and make ’em ASAP!! If you’re following me on Instagram or you’re up to date on all of the latest blog posts, you may (or may not) know about my dairy-free and soy-free diet. It’s totally temporary, no more than 6 months, but it does kind of make taste testing new recipes challenging. I’ve been surviving on fruit, veggies, protein, coconut-based products, pasta, and popcorn! I’m still cooking and baking. You’ll still see recipes with dairy and soy in them (previously tested by myself or family members), but you’ll also see lots of little gems like this one. They were born out of desperation and a really intense chocolate craving. 😂😋 P.S. 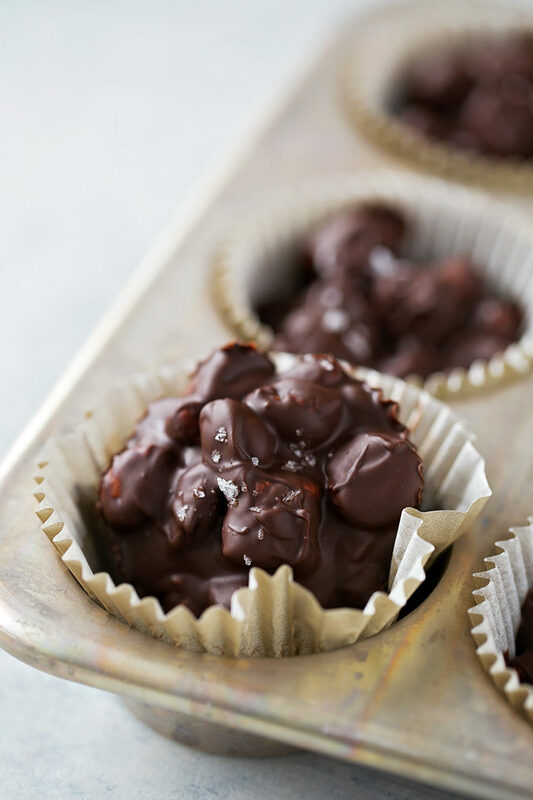 these can be made just about any kind of chocolate, including Enjoy Life products for foodies like me! Um hello. 👆 That’s like the shortest ingredient list ever. Right?! 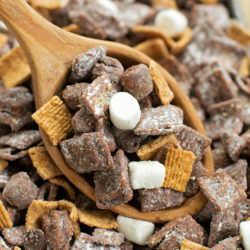 Like I mentioned above, feel free to use whatever chocolate you prefer. If it was just regular ole Natalie, I’d probably grab a bar of Ghirardelli or Guittard semisweet chocolate. But since they’re dairy and soy based, they are both currently no-gos. Grab a jar of roasted peanuts (I prefer using unsalted or lightly salted in recipes) and your fav mini marshmallows. When it comes to choosing coconut oil, you do you. Unrefined and refined both work. Refined coconut oil is a clear, mild-tasting oil. It’s best for recipes where you don’t want a strong coconut flavor and for frying as it has a smoke point of 450 degrees F.
Refined or “virgin” coconut oil is extracted from fresh coconuts and undergoes no bleaching. With a more gently refinement, you get bold coconut flavor. It’s best for candy making, no-bake recipes and baking as it has a smoke point of 350 degrees F.
I personally prefer refined in this recipe and keep the unrefined for these cookies and these muffins. Grab some quality vanilla extract and some flaky sea salt and you’re good to go! Once you’ve got everything mixed together, spoon them on or in whatever you choose as a form and then pop them in the refrigerator to set. Waiting is the hardest and most time consuming part of this recipe. And let me tell you, it is hard!! 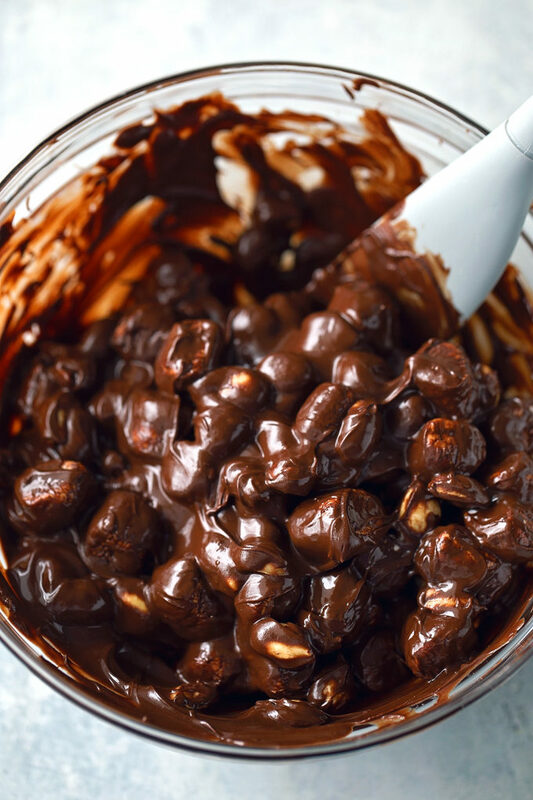 In a medium microwave-safe mixing bowl combine the chocolate chunks and coconut oil. Heat on HALF power for 1 minute, stir and repeat if needed. 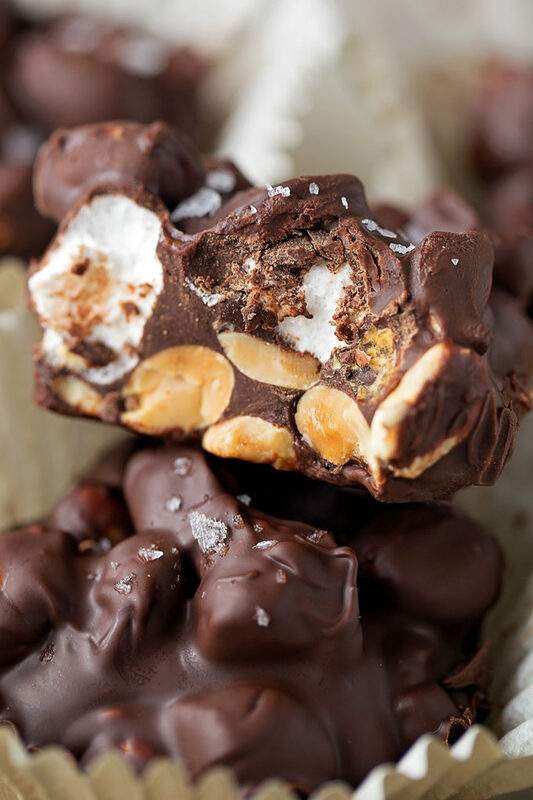 Mix chocolate until smooth, then add in marshmallows, peanuts and vanilla. Stir to evenly coat, then drop onto a parchment or silpat lined baking sheet, paper lined muffin tins, or a parchment lined loaf pan. Sprinkle with a pinch or two of sea salt. Place in the refrigerator and chill until set, about 20-30 minutes. Store in refrigerator. hey girl- these cups look oh so yummy! y’all have a great weekend!